Understanding and determining the right caster for your requirements is of utmost importance. 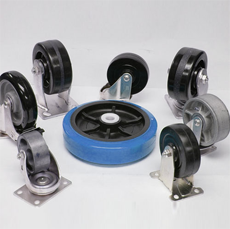 There are casters that may be fixed to roll along a straight-line path, or mounted on a pivot such that the wheel will automatically align itself to the direction of travel. We at Caster Technology make it our point to fit the right caster to each and every individual need. A basic, rigid caster consists of a wheel mounted to a stationary fork. Rigid casters tend to restrict vehicle motion so that the vehicle travels along in a straight line. A swivel caster incorporates a wheel mounted to a fork, but an additional swivel joint above the fork allows the fork to freely rotate about 360°, thus enabling the wheel to roll in any direction. Swivel casters can sometimes be attached to handles allowing an operator to manually set their orientation. Locking casters are an assembly that can be locked in place by some sort of mechanic device. This is commonly achieved using a lever that presses a brake cam against the wheel. However, a swivel caster is still able to move around slightly, so a more advanced locking system is required.